Last year, when I complied and submitted my top ten photos for the year, they all felt somehow right, like each one had earned its place in the list. Everything felt natural, as if “yes, these are the top ten photographs for 2011”. This year couldn’t have been harder. I’m not going to get ahead of myself and say that I had “too many” good photos to choose between them. I’m not conceited. That being said, I’m not going to play the “I can’t find one good photo, let alone ten” card either, because I know I got plenty of good shots this year. The problem is the curse of knowing too much. That XPT shot at Donnybrook, look at the colours there! That’s a shoe in. A closer look reveals that it’s crooked. The headlight shot from the final ZZR train of the year? Looks like I’ve cut the top of the signal box off slightly. Too much blur here, not enough there. I managed to find something wrong with almost every shot that I suggested – that’s not to say that they are necessarily “bad” shots. Just that I know how they could be better, because I pressed the shutter. The new “Waratah” Public/Private Partnership (PPP) trains are being built by Downer EDI, for Reliance Rail who will lease the trains to RailCorp for CityRail suburban service. 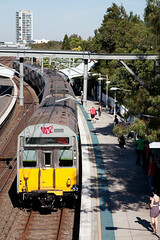 Named “Waratah” trains, the A-Sets will enter service from late 2010 to facilitate the removal of the aging fleet of S and R sets from the CityRail fleet. 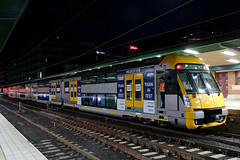 The project celebrated another milestone on May 1st, with the special 4-car Pre-Production Test Vehicle (PPTV) delivered to Sydney behind 442s1. Unlike the revenue service trains, this train is only a 4-car set, designed specifically to test out the new trains reliability and compatibility with the network. Like the OSCar trains before them, the Waratah will be subjected to an intense testing regime, to ensure that there will be no “surprises” after they enter service. The NSW Government does not need a repeat of the Millennium Train debacle, especially not around the time of an election! Unlike the OSCar order before them, the Waratah order is the first to use a dedicated pre-production test vehicle (PPTV), with the purpose of identifying any oversights or faults in the train design or train components before too much work is done on the rest of the order. In the case of the OSCar trains, a number of 4-car sets were subjected to intense testing prior to entering service, and the sets involved were then sent back to United Group to be rebuilt, so as to be delivered in “as new” condition. The PPTV vehicle however, has entered service without any passenger seating, or any other passenger amenities. Aside from some dummy weight added, and testing equipment, the train is a shell – for the sole purpose of testing the trains design. Since being delivered, the PPTV (also known as A0 within the enthusiast community), has run a number of trials around the RailCorp network in the dead of night (usually under a local possession authority, to ensure no adverse results to late night services). Typically, the PPTV is hauled to and from the possession by 442s1, which remains fitted with a special transition coupler. The cars used on the PPTV will be delivered as part of the final order, and are numbered as follows: D6479, N5442, N5342, D6379. S52 is seen here at Erskineville with a service to the City Circle from the Bankstown Line. Scenes like this will soon be no more! On June 28th, the first 8-car Waratah Set (A1) was delivered in the same manner as the PPTV, behind 442s1. The carriages delivered were numbered as follows: D6301, N5501, N5601, T6501, T6601, N5401, N5301 and D6401. This follows the existing numbering scheme as set out by previous CityRail trains, with “D” being unpowered driving cars, “N” being powered vehicles and “T” being unpowered non driving cars. The main distinction between the A-Sets and previous carriage numbering schemes, is that the cars on the train have a different number – e.g one driving car is D63xx and the other D64xx. Normally, all cars are delivered in sequence, in this case this would be from D6301 onwards in sequence – thus, D6401 would previously have been the 101st car to be delivered, not the second as it is in this case. Previous deliveries have followed this scheme – in the case of the OSCar trains for example, all driver trailer cars are numbered in the D69xx series, the Millennium trains before them numbered in the D10xx series, and so on. Like the PPTV, A1 has been delivered without seats or exterior decals or logos, and will also be used to extensively test the new trains before they are approved for use on the system. It is expected that A1 and the PPTV will be used for further night testing before the PPTV is returned to Downer EDI, and deliveries of revenue sets can then begin. It is expected that the first A Set will enter revenue service before the end of the year. DL44, DL46 and VL351 await permission to leave the Sandown Line for the final time with 1877 freight to Dubbo. Patrick PortLink (PPL), the rail operator for Patrick Corp (a division of Asciano Limited, owners of Pacific National) have ended their NSW rail operations. The first PPL service to be cut was T181/T182, Sandown to Botany container trip, with the final train running to Botany as T182 on Friday the 14th of May, 2010 behind hired motive power 48136 and 4887. This was followed by the final revenue service from the Patrick Terminal at Sandown (also known as Seaton’s Sidings) running as train 1877 to Dubbo on Saturday the 12th of June, behind DL44, DL46 and VL351. For the final week of operations, 1877 would stage directly out of Port Botany, until the final service ran on Saturday the 19th of June. The final PPL train in NSW would operate on June 26th, with DL44, 48136, 4503, DL46 and VL351 hauling 45 empty container flats to Enfield. The container flats were supposed to proceed onto Lithgow for long term storage with 4503, although for one reason or another, this never eventuated. DL44 and DL46 were to then return to service with PN Southern Coal, 48136 returning to PN Rural and Bulk and VL351 off-lease and returned to CFCLA. For a full wrap up of the final PPL operations, look out for a forthcoming article detailing the final trains, as well as a more detailed summary of their final months of operation. As previously covered on Trackside (News to Me: The End of Sandown? ), it would seem that the Sandown Line may be the next goods line in Sydney to close. With Shell Australia ending fuel services from their Sandown terminal in March 2010, and Patrick closing down their Sandown container terminal in June 2010, there would be no logical reason to keep the line open (unless another operator expresses interest in the Seatons facility). The line was booked out shortly before the end of June, only to be booked back in to allow Patrick PortLink to store some wagons in their sidings. Currently, the line is certified for use up to the Rosehill Accept signal, which is where the OHW on the line ends (it once extended as far as Sandown, although it has been long since removed). This allows the main platform at Rosehill to be used for Race Trains, although the line is unlikely to see any regular traffic other than these trains. 8044 rolls through Campsie with a short frieght bound for Port Botany. Services like this one, run by South Spur Rail Services, will now fall under the control of P&O - possibly with different motive power, possibly not! The line is not yet closed, although no more traffic will regularly travel past Rosehill. As well as the PPL owned wagons at Sandown, Shell Australia also has a number of NTAF wagons stored in their sidings next to the Patrick facility. It is likely that these wagons will need to be removed eventually, either to be stored off site to allow the land to be used for other purposes, or for the wagons to be cut up and sold for scrap. 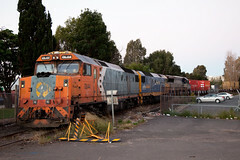 Coote Industrial sold subsidiary company South Spur Rail Services to P&O Holdings Pty Ltd during June 2010. As well as the wagons owned and used by South Spur Rail Services (SSRS), a number of locomotives were believed to have been included in the sale. The remaining locomotive fleet owned by Coote Industrial (acquired during their purchase of ALLCO Rail only a few years prior) will remain operated by Coote Industrial subsidiary Greentrains. Greentrains will continue to lease motive power to P&O for their trains, although what locomotives have remained with Greentrains and what locomotives were included in the sale is yet to be released. At the time of writing, it is unknown if P&O will continue to operate under the P&O Trans Australia name or roll all of their services under the South Spur name. Of course, the reverse may occur, with those services operated by SSRS brought under the P&O Trans Australia company name. Current motive power on SSRS trains include members of the RL, 80, 830, 600, 48s, 442s and C Classes. P&O Trans Australia trains are currently operated by P&O owned 4471 and/or 4477, as well as leased motive power from CFCLA, including members of the G, EL, GL, VL, 442 and S Classes. P&O have previously hired members of the KL Class from CFCLA, as well as members of the CLF and CLP class from QRNational. G514 leads B61, B65 and G513 south through Cowan with NW08 export coal from Newstan Colliery to Inner Harbour. 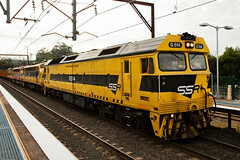 Southern Shorthaul Railroad (SSR) has entered the coal haulage market, with their first coal train from Newstan Colliery to Inner Harbour commencing operation in April 2010. Previously, all export coal from Newstan was hauled by Pacific National to either Inner Harbour or Kooragang Island, although when Newstan Colliery increased production and requested an extra rake to serve the mine, Pacific National was unable to comply (either due to locomotive or rolling stock shortages). This resulted in SSR winning a contract to transport coal from the mine to Inner Harbour four days a week (typically Monday to Thursday), and to Kooragang Island on the weekends. A rake of CHAY mineral hoppers were leased from CFCLA to undertake the contract, running as train NW08 from Goulburn to Newstan on April 20th. The locomotives used for the first month of services were SSR owned G513, B65, B61 and G514. 44206 replaced B61, then B65 for a short period at the start of June, with S317 replacing B61 at the time of writing. Originally a contract for three months, it would seem that this has been extended, with SSR looking to purchase further motive power and rolling stock to provide a more cost effective service. The author would like to extend his thanks to Fred Sawyer, Maikha Ly, Chris Walters and the members of Railpage Australia and the Ausloco Yahoo Group for their assistance in compiling this article.